"Tahuichi has caused a revolution in youth soccer around the world. It is a great example which must be imitated. Children are the future and Tahuichi has understood that very well." "In the case of the Tahuichi Academy, I see a plan with designs for a great future in soccer. At the same time, it is a demonstration of how intelligent and systematic action, with continuity, makes it possible for positive results to be continuously obtained for Bolivia, not only in the sporting arena, but also with society and in the life of our youth." "I congratulate these youngsters who have delighted us with their play; the Argentinean people have been impressed with their behavior on the playing field, both individually and collectively. I think this is the result of work well done by their coach and directors. The collective soccer which Tahuichi plays is the best I have ever seen." "Tahuichi has, in its play structure, the ability of the Argentineans, the cadence and rhythm of the Brazilians and the dignity of the Uruguayans and Paraguayans. They are a phenomenon. A real, live demonstration of how the sport of soccer should be played. They should be seen by everyone involved with the sport. Their challenge is simply that they will play better. It is a challenge that makes for great games." "It was an honor for FIFA to have the 'Tahuichi Aguilera' soccer team represent Bolivia in the first Infant-Juvenile World Football Tournament organized by the FIFA. The work that the Academy is carrying out for youth is not only recognized within football circles, but also everywhere in the world. Tahuichi is the best example of my GOAL Program, which I intend to implement around the world." "I would like to express my profound admiration for the Tahuichi Aguilera Academy. This institution, for more than 20 years and without any help from the government, has been providing a healthy and mature environment for Bolivian youth. They are an inspiration to youth everywhere." 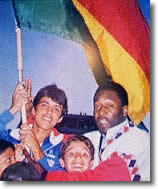 When I was thirteen, I had the chance to attend the Tahuichi Soccer Academy in Santa Cruz, Bolivia. My mom had some apprehensions about letting me travel by myself to a third world country at such a young age. After much debate, we decided that it was a good idea as I would not only get a chance to improve tremendously at soccer, but also have a month to work exclusively on my Spanish. Surprisingly, the most important lesson I learned from Tahuichi was not about soccer or Spanish, it was about life. The first thing I realized upon my arrival to Santa Cruz was how little everyone had. The cars looked banged up and many of the houses looked dilapidated. Most children ran around in little more than rags. My first reaction was one of sympathy. I could not help but feel sorry for these people that had nothing, and I could not imagine what it was like to grow up under those conditions. After living with a Bolivian family for four weeks and getting to know many of the people that lived in the city, I realized that sympathy was not the right emotion. These people could be happy with seemingly nothing. I realized the Bolivian people have a different approach to what happiness is. To them, happiness is not found in what they own or what they can buy, happiness is in the moment, the pure act of living. Beyond the essential requirements of food, clothing, shelter and basic health, they demonstrated that real happiness has little to do with material wealth. They laugh, smile and joke just as brightly, and perhaps more genuinely, than their wealthy counterparts in the developed world. It is almost as if money does not play a role in their lives, as if money did not count for anything. It has been poverty that has forced the Bolivian people into finding happiness in other things besides their possessions, leading one to believe that poverty might be a blessing in disguise. Although poverty has the ability to greatly disable people, it also allows the impoverished to step back and realize what is important in life. Seeing the world from the perspective of the poor, and gaining a deep respect for these people, has forced me to question and re-evaluate many of the beliefs I was brought up with. I've realized that we live with extremely narrow perceptions of success, believing that the pursuit of monetary wealth and physical assets will somehow bring us long-term happiness. It is important to be able to take a step back and figure out what really matters in life, to figure out what you really want in life. It will not necessarily be money, promotions, possessions, or other more "worldly" things. These are not necessarily bad in themselves, but they won't ultimately fulfill you and shouldn't be the main focus of your life. I also realize that the relative unimportance of worldly things should not be confused with the need for self-effort. God has given me many talents, and I feel best when I am using my abilities to the fullest. I am thankful to the Bolivian people for teaching me that happiness does not come from things, it comes from within. Captain, USA U-17 National Team, FIFA World Youth Championship, Ecuador '95 and currently playing in MLS. "Tahuichi is the place to be if you want to become a very good and intelligent player. For me Tahuichi is the greatest place to be for soccer. I came here because I played against Tahuichi in San Francisco and I liked their style. The way they touch the ball. The fact that they like to dribble and because every single player can do the same thing. Being here has helped me. I don't know how much it has affected my play.... but I know if I spent the time at home, I wouldn't be practicing twice a day, everyday." "It was tough last summer, but it made me a better soccer player, and that was my objective. I love to play soccer, and I want to be the best I can be.... We trained on bumpy, dirty fields. It really helped improve my skills, like trapping and controlling the ball. It has made it much easier playing at home on grass fields.... As for the dunes and river runs... You run up these dunes, which are about 100 feet high and at a 45 degree angle. You also run about 4-1/2 miles around the dunes. At the river, you run about 3 miles, then run from 50 to 100 yards against a stiff current in water about 2 feet deep. Both the dunes and river runs were hard, but I didn't mind them. They helped my fitness and strength." 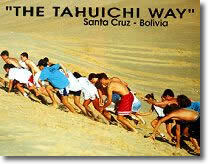 "At Tahuichi we learned how to play hard, and concentrate, and train correctly. So now we do more in 1-1/2 to 2 hrs than we did in 4 hours before." "Tahuichi is the best training I have ever experienced. I like Santa Cruz and think it is much safer and cleaner than many US cities. For people who love soccer, Tahuichi is the perfect environment." "Tahuichi is the dream program for anyone who wants to go as far as they can in soccer. It tests one in every way imaginable, from one's physical toughness to one's love for the game. Tahuichi is beyond sport. Tahuichi is life." "I thought I had experienced hard training in my life, but until you experience Tahuichi you will only be imagining that you have experienced hard training." "Tahuichi is not just about kicking the ball around. It's about learning to love every aspect of the game." "Tahuichi is not only a wonderful soccer experience but a wonderful experience for life."